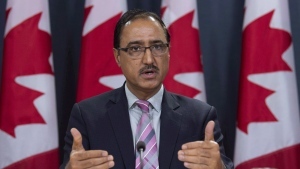 The federal government will announce its decision Tuesday morning that the Trans Mountain pipeline will move forward -- with public money on the table. Finance Minister Bill Morneau will announce his decision in a press conference early Tuesday morning before financial markets open. The announcement will come just two days before the May 31 deadline set by Kinder Morgan to decide if it’s confident enough to proceed with construction. It remains unclear how Ottawa plans to finance the controversial project, but three options are on the table. The first and most likely option: the federal government buys and builds the Trans Mountain pipeline expansion. Ottawa has expressed interest in starting construction as soon as possible to take advantage of the brief summer construction season. Once the pipeline is built, the government would then try to sell it to new investors – putting Kinder Morgan out of the picture. The second option would also involve the government buying the expansion, and then selling it to investors. Investors would then be responsible for the pipeline’s construction. Morneau has already openly discussed the third option: Kinder Morgan going ahead with the project, with Ottawa covering any losses incurred. Morneau is expected to detail the federal government’s plan and confirm a price tag in the announcement. Shortly before the announcement, Morneau will brief his fellow cabinet ministers on the decision at 7:30 a.m.
Prime Minister Justin Trudeau has repeatedly pledged to get the project built. Alberta Premier Rachel Notley and British Columbia Premier John Horgan have been at odds over the pipeline. Protests have taken place across Canada both for and against the pipeline. On Monday, Green Leader Elizabeth May was ordered to pay a $1,500 fine for her involvement in an anti-pipeline rally at a main gate to Kinder Morgan's pipeline terminal.